Haven’t posted in a while….Sometimes I just get busy! 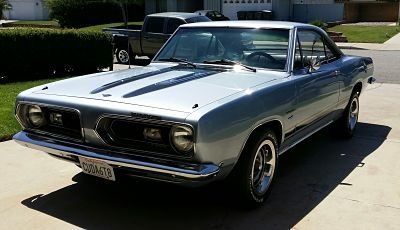 I’ve been keep busy on the ‘Cuda with a rather limited budget. I’ll start by saying I’ve been driving it quite a bit – boy is this a great driving car! It idles VERY nice (once it’s warmed up!). I would like a little more power, but that’s always the case. It just feels so nice over the bumps and through the curves! I can’t wait for Spring and Summer to come – not that I can’t drive it in the California Winter (except rain – NO rain!). It’s very dependable now and could easily be a daily driver except I don’t want to wake up the neighborhood every morning at 4am! So I’ve been working on the tuning, installed new mufflers (Flowmaster Super 44s), and just working out lots of little details.